Need to satisfy your burger cravings? 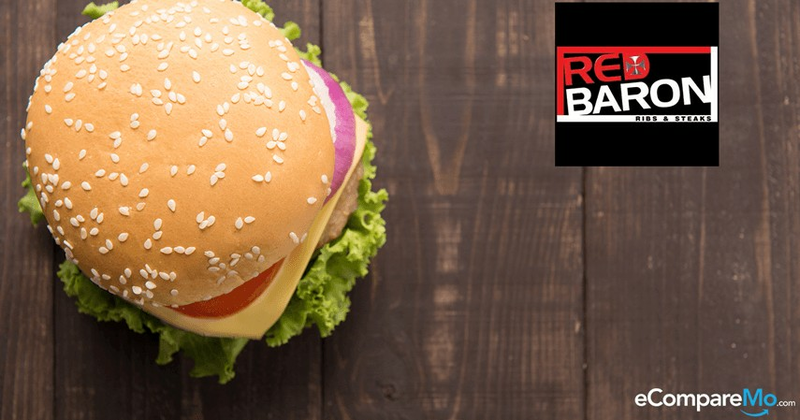 Get a free Red Baron Burger 101 with a minimum single-receipt purchase of P2,500 at Red Baron using your EastWest Credit Card. Promo runs until June 30, 2016. – The promo is open to all EastWest Credit Cardholders (“Cardholders”) with good credit standing. Whose accounts are not delinquent, under investigation, or suspended, lost or stolen, and has not violated any of the Terms and Conditions Governing the Issuance and Use of EastWest Credit Cards. – Cardholders will get a freeRed Baron Burger 101 for a minimum single-receipt purchase of P2,500 charged using their EastWest Credit Card at participating branches of Red Baron. – Participating branches: D. Tuazon corner Calamba Street, Lourdes, Quezon City; and Bambang, Sta. Cruz, Manila. – Cardholders must present their EastWest Credit Card upon ordering and/or before paying their orders. – Only one (1) EastWest Credit Card may be used to avail of the promo offer. Splitting of credit card transactions to be able to avail of more than one (1) free Red Baron Burger 101 will not be allowed. – The offer is valid for dine-in and takeout transactions. – Promo offer is not transferable to cash or gift certificates and is not valid in conjunction with other marketing promotions, offers, discounts, privileges, or giveaways.